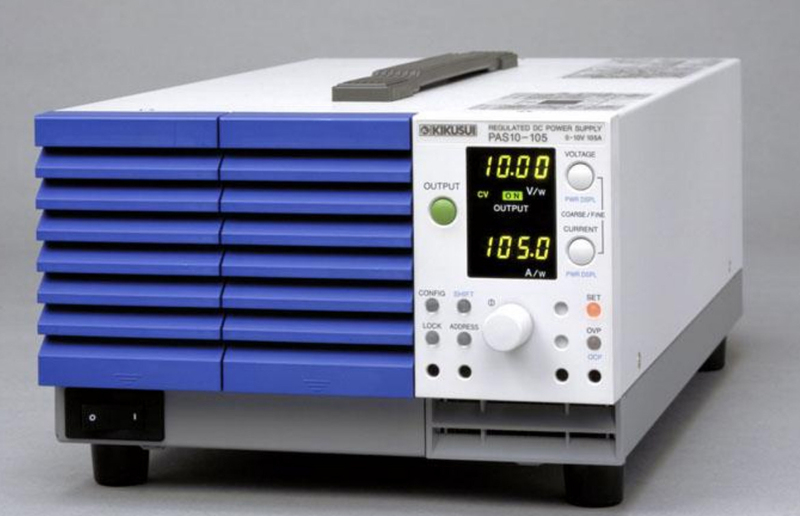 Kikusui PAS 20-54 DC Power Supply. 0-20V, 54A, 1kW. The PAS Series consists of sophisticated variable-switching DC power supplies that refine and add to the advances of our conventional PAK-A Series. While the cabinet size remains unchanged from conventional models, the PAS Series incorporates a high-efficiency switching circuit and a power-factor correction circuit to meet the needs of today's users. Provided with Kikusui-developed digital communication functions (TP-BUS: Twist Pair Bus) as standard equipment, this Series can handle power supply systems ranging from small scale (two units) to large scale systems (up to 448 channels in combination with power supply controllers of the PIA4800 Series via GPIB) at low cost. The distance between the controller and power supplies can be extended up to 200 m for use in applications such as plant power supply control from the PC at office.